Alaska Ciderworks is a family owned business located in Talkeetna, Alaska. It was established in 2016 alongside Alaska Meadery by craft driven vintners. Although one of the most popular alcoholic drinks in the world, cider fell out of fashion after prohibition and only recently has the craft cider movement gained momentum. 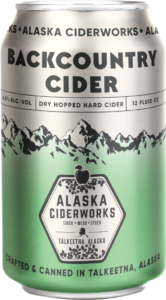 Alaska Ciderworks endeavors to contribute to this artisanal cider renaissance by producing crisp and refreshing ciders that are as delicious as they are innovative. With the continuous growth and development of our Orchard and Farm, Alaska Ciderworks strives to produce ‘branch to bottle’ craft beverages. 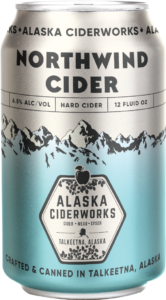 Alaska Ciderwork’s Northwind Cider is clean, crisp and favorably aromatic. Seasoned cider drinkers will be gratified by its natural apple crispness that is intrinsic to a well-crafted cider and enjoy its harmonious balance of tart apple, slight tempering sweetness and hints of mango. This sessionable cider is fermented with champagne yeast lending it a delightful effervescence reminiscent of a brisk autumn day, but to be enjoyed throughout the seasons. Alaska Ciderwork’s Dry Hop Cider is deliciously flavor packed. The Cascade hops contributes a fresh, citrus flavor that compliments the natural apple crispness intrinsic to all well-crafted ciders. The earthy and sweetly tart aroma of the Golding Hops works to compliment and elevate the cider’s naturally dry characteristics making this cider is a brightly unique and delightful experience.